On 11 April 1814 Napoleon Bonaparte abdicated as the ruler of France. The war against Napoleon had been Great Britain’s main effort. 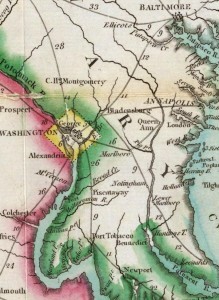 With Napoleon gone, Britain focused their effort on America, and considered two targets, located forty miles apart, on opposite sides of the Patuxent river: Baltimore, Maryland and Washington City. Baltimore was a rich city, a major seaport on the Chesapeake, the location of a large naval shipyard, and the home port of hundreds of privateers that savaged British commerce worldwide. Plunder from its capture would enrich the attacking force, as every soldier and sailor would receive a portion of the booty; its destruction would deprive the United States of a strategic asset and avenge the honor of the British Navy, embarrassed daily by their inability to stop the American privateers. Washington City paled in comparison, a shabby town of eight thousand inhabitants, still very much under construction, featuring a few spectacular government buildings, such as the Capitol Building and the Presidential Mansion. It was, however, the nation’s Capital, and a swift attack might net the British valuable plunder of a different sort: the Declaration of Independence and the Constitution, fragile bits of paper that knit together the fabric of this unique experiment in democracy; members of congress and the Supreme Court; key personnel and documents from the War Department; perhaps even the President and Presidentress, little Jemmy Madison and his flamboyant wife Dolley. Seizing this plunder would devastate the fragile moral of the nation, ending this expensive war on terms favorable to the British. The Americans knew the blow would fall, did not know where or when, and watched. The British spent the Spring and Summer of 1814 raiding up and down the Atlantic coast, and in particular the Chesapeake Bay area. The anticipated British reinforcements arrived in July. The fleet feinted to the left, up the Potomac towards Washington. Then they feinted to the right, up the Chesapeake towards Baltimore. In August, sixty vessels sailed up middle, following the Patuxent River to the town of Benedict. This was no feint. Over four thousand battle-hardened British soldiers disembarked, fresh from their victory over Napoleon, and anxious to give “the colonials” a lesson in Continental warfare. 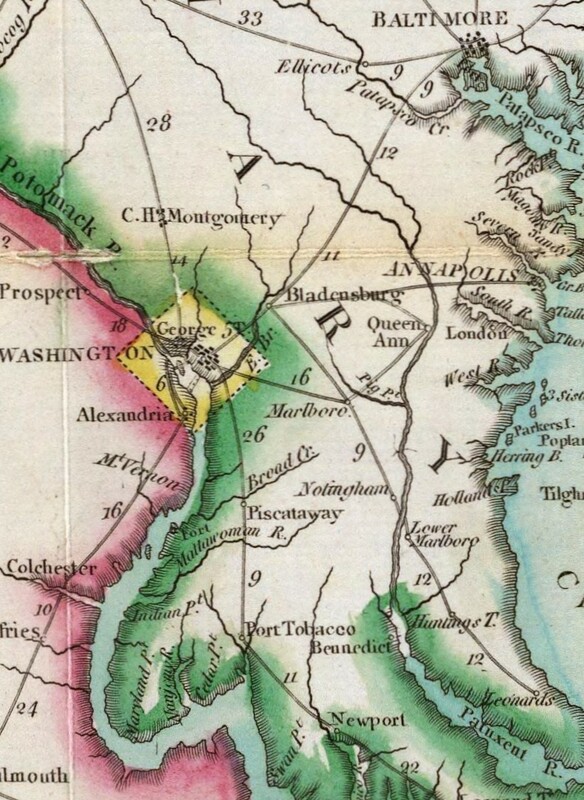 On 20 August 1814 they marched to the northwest towards Washington City. This was written by Neil Garra. Posted on Monday, April 4, 2011, at 09:15. Filed under Research Tidbits. Tagged Historical. Bookmark the permalink. Follow comments here with the RSS feed. Both comments and trackbacks are currently closed.